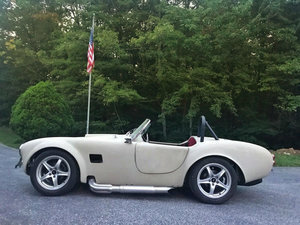 1966 Shelby Cobra Factory Built - Replica Car This unit is ready to go with only 1,670 miles. Jaguar front and rear suspension. 351 Ford Windsor Engine. C4PW Transmission - Slap Shifter - Automatic Aluminum Scatter Shield. Stainless Steel Fuel Tank, Expansion Tank, Fire Wall, Side Pipes and Roll Bar. Convertable Top Included. Ceramic Headers. Leather Upholstery. Smith Gauges.